Now that I've implanted that 'earworm' for you. That's what a tune is called that you just can't get out of your head. But that song isn't the focus of this posting. What is the focus, is this photograph. 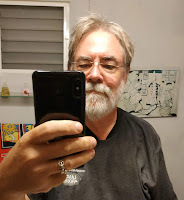 Well, that and the fact that the black object I'm holding in front of my bathroom mirror (at 2:45 in the morning) is my first smartphone. I resisted as long as I could. I have to say, it is pretty cool having something you call a 'phone,' but is generally considered only a phone a minuscule part of the time. It has the capability to do so much more, it's almost as if you were carrying a desktop PC around in your pocket. The other fun fact is that this isn't some derelict from AT&T, Verizon or some other big communications phone. This one, a Redmi Note 5, an Android phone, came directly from China, banggood.com, in fact. It was mailed to me directly from Hong Kong to Belize. That's actually the second thing I've ordered from them, the first being a digital kitchen scale, that worked fine until I ruined it by letting some fruit or veggie drip its innards on it, which seeped in and ruined the screen and the electronics. I guess it wasn't quite as waterproof as I thought it was going to be. My replacement digital scale, by the way, if you're interested, I found at One Mall, our super-sized (for Corozal) grocery and other-stuff store. The scale now hangs on the side of a kitchen cabinet, safe and dry. I know that taking a selfie is no big deal these days. But, it was my first one, and I wanted to share. What was weird though, is this. Give it a try. First, while you're in front of a mirror, hold up your phone, and wave it in front of your face. Look at the phone screen. It blocks your face, right. Now switch the view of the camera and wave the phone in front of your face. In the mirror, it still appears to block your face, right? But, if you look in the phone's screen, your hand is invisible. If someone was a stoner and tried that with a buzz on, that would provide at least a half-hours entertainment, wouldn't it?